Amidst the somewhat predictable, often clichéd, only ever slightly varied, and mostly profitable storylines that crowd film production the world over, there exists a niche occupied by filmmakers who are interested in telling stories about poverty. Quite like their more profitable counterparts, the stories that emerge from this niche often straddle genres, giving us romance, drama, tragedy, and even the famed Hero’s Journey. Central to the plot and to how we ultimately feel about the characters, however, is the thematic preoccupation with poverty. Of course, there is an inherent paradox in the production and consumption of narratives of poverty. Often (though not always), the people who write, make, and watch these films have themselves had no experience of what is being depicted. This is not to say that you can only write, direct, or consume that which you have lived through yourself: if that were the case, the entire genres of sci-fi/fantasy and horror would not exist, not to mention a great number of thrillers. But poverty is a theme rather than a genre. A writer could do justice to the sci-fi/fantasy genre when writing scenes for the Star Wars franchise. But if they have no understanding of the potential complications of a father-son relationship, they would probably be unable to do justice to that particular thematic strain within the genre. Similarly, when those without any lived experience of social disenfranchisement take on the task of telling a story based on this theme, implicit in the undertaking is the risk of a less-than-satisfying result. And the stakes are high: it’s no longer just about the misrepresentation of, say, a father-son relationship. It is about the potential dehumanisation or romanticisation of an entire class of people. It is unsurprising then that historically, films that tackle the theme of poverty have taken stances that range from pitying their subject to depicting them as the innocent who must be sacrificed for the rest of humanity’s greed. If Slumdog Millionaire gave us a voyeuristic yet triumphalist narrative, Meghe Dhaka Tara exposed the defeat of not having—and not being—enough. If City of God was an operatic crime thriller hurtling towards complete destruction, The Pool used its stylistic simplicity to give us hope for the boys in question. Every once in a while, however, a film comes along that tells the story of poverty with the straightforward realism of The Pool, while withholding the beacon of hope that film insists upon. A film that uses, like Slumdog Millionaire, a romance plot to generate sympathy for its protagonist, but is swept clean of its fairy dust of triumphalism. A film like that is a treasured find, even if it leaves you scrubbed raw. 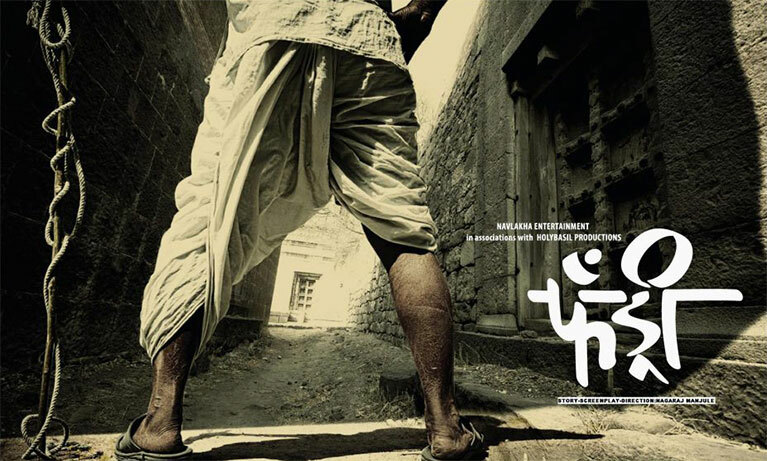 And Nagraj Manjule’s Fandry, a 2013 Marathi feature that won the Grand Jury Prize at the Mumbai International Film Festival and the National Award for Best First Film by a Director, is just that kind of film. Ostensibly, Fandry is a love story. The film begins with a meditative shot of a young boy walking through a forest, listening for the call of a particular bird. This is our hero, Jabya, hunting desperately for the rare “black sparrow”. Why the black sparrow? Because he is in love with Shalu, a girl in his school, and has been told that blowing the ashes of a black sparrow can get a person to love you back. Yes, this is a quest born of the sort of superstition most of us would dismiss immediately, but in the first few minutes of this film it is enough to make us root for Jabya. We want Shalu to notice him over all the other boys in her class. We want her to fall for him as hard as he has fallen for her. Above all else, we want Jabya to have a conventional happy ending. But then the director starts to peel the skin off the details of Jabya’s life, bit by painful bit. Jabya’s family is desperately poor. Despite being a diligent student, Jabya falls behind in school because of prolonged absences whereupon he helps his parents with work. And in the film’s present, things are particularly tough financially: Jabya’s sister is about to get married, and her dowry must be paid to ensure her happiness in her future husband’s home. Shalu, on the other hand, lives a relatively charmed life, owing to the fact that her father is one of the richest men in the village. Her family also enjoys the privilege of high caste, whereas Jabya’s family is so far down that ladder, their presence is only acknowledged when someone in the village needs a load of garbage cleaned up. Given this scenario, we quickly understand that Jabya’s romantic aspirations are quite entirely hopeless. But even under the weight of this mortar-strong social structure, Manjule manages to conjure hope. Jabya is a clever boy, and his dedication to Shalu ensures that he doesn’t let anything or anyone get in the way. When the class bullies mock his affection for her, he simply ignores them. When his mother makes it clear that she can’t afford the pair of jeans and new T-shirt he deems essential to impressing Shalu, he takes up an after-school job to make some extra cash. When some upper caste men try to shove him out of a village parade that Shalu is watching, he stands his ground, unfazed. And then there is the elusive black sparrow. If all else fails, Jabya would still have a chance at getting Shalu to notice him by catching one of these birds and reducing it to ashes. Once that plan is put in place, even a force of planetary proportions would not be enough to stop their union. In the midst of this torrid mix of romance and social politics, Manjule’s greatest strength lies in presenting us with a rich and well-developed central character. Despite all that goes on around him, Jabya is a teenager as typical as any other. Our bond with him is strengthened by the fact that we relate with some of his experiences of going through the most self-conscious phase of life. He is embarrassed when his mother shows up at his school, he feels the need to dress like his peers so that they think of him as an equal, and he insists on taking advice from a man his father thinks untrustworthy. And he daydreams about the girl he has a crush on in the style of a Bollywood film, complete with an idyllic, verdant backdrop, slow-motion editing, and a chiffon dupatta billowing in the breeze. Some of this relatability owes to the fact that the experience of being a teenager is universal in more ways than we realise. But mostly, Jabya is afforded all this because the community he lives in isn’t stranded in some kind of savage, medieval setting. This isn’t a village of bonded labour and feudal slavery. This is a village in modern India, a village touched by the legend of Ambedkar. Caste exists simply because caste isn’t something that can just cease to exist. But the very facts that children of all castes go to the same school, and that untouchability isn’t practised in a stringent manner, indicate that this community is definitely above average in terms of social progress. And herein lies the brilliance—and brutality—of Manjule’s storytelling and direction. With comforting whispers of hope, the director convinces us to ignore instance upon instance of insidious casteist exploitation. By eliminating the kind of overt violence that is still commonplace in many communities in India, Manjule tricks us into forgetting all about the violence that is always lurking just around the corner. By the time it occurs to us to look at our feet, the ground has been swept right off from beneath them. Because even when a larger-than-life portrait of Ambedkar is looking over you from the compound wall of the local school, there is only so far the love story of a lower caste boy and an upper caste girl can go. Fitting the dramatic scale of this denouement—but oddly enough, also staying loyal to the spare aesthetic of the film—the climax unfolds with Jabya and his family chasing a pig: the “fandry” of the title; that filthy, untouchable creature that the village wants to get rid of but can’t because the upper castes won’t touch it. In this final sequence, as Jabya chases the pig, who chases his family, who chase Jabya, who chases the pig, the symbolism of the title grows bigger and bigger, pushing the characters to the point of explosion. Fandry is a wonder for many reasons: I find the use of non-professional actors and location shoots particularly interesting. But above all else I find it to be a great story because of the space it occupies in our current moment of social discourse. It is brutal, yes, but only because it is an uncomfortable representation of the reality of large parts of our country. And if you’re willing to confront that, I recommend you watch it. Neha is a writer who lives between Hyderabad and California. She enjoys good books, good wine, good (and bad) cinema, the company of cats, and sometimes even the company of interesting people.